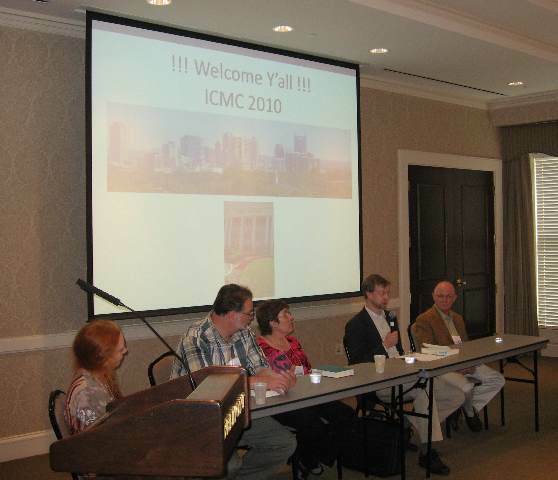 I had a wonderful time attending the 27th International County Music Conference in Nashville this past weekend. You can see me hard at work in the picture below! I can’t tell you how much fun it is to be hanging out with the people who write the books about country and bluegrass music. Bill Malone, who wrote Country Music, USA (and who is working on a biography of Mike Seeger); Wayne Daniel, who wrote Pickin’ On Peachtree: A History of Country Music in Atlanta; Nolan Porterfield, who wrote the definitive biography of Jimmy Rodgers; and of course Neil Rosenberg who wrote Bluegrass: A History, which was the subject of the panel I was on. Don’t those make you want to come to the conference next year? As I mentioned during my hard hour’s work on the panel (! ), I reviewed Wayne Daniel’s book for Bluegrass Unlimited (years ago) and I was especially taken with his opening, which I remember well. He wrote, “If I had been blessed with an iota of musical talent this book would never have been written. I would have been too busy picking a guitar and singing country songs.” Love it, Wayne. I’m not sure what that had to do with Neil’s book, but it seemed relevant at the time. Right now, I’m trying to finishing packing for my early morning departure to Lansing, Michigan, for the Midwest Banjo Camp, which is being held at Olivet College in Olivet, Michigan. Interestingly enough, Casey and the Dixie Bee-liners will be appearing close by on Friday and Saturday at the Niles Bluegrass Festival in Niles, Michigan. Weird to have her so close by, yet not be able to go see her! So, in the interest of my actually being able to get a few hours of sleep before my alarm goes off at the ungodly (for me) hour of 6 a.m., I will close. [And I know all you hard-working early birds are rolling your eyes!] Hope I see some of you in Michigan. If not there, Kaufman Kamp is coming up soon! Posted in By Murphy and tagged books, ICMC on June 3, 2010 by Murphy Henry. This morning, I am getting ready to head for Nashville for the International Country Music Conference which is being held at Belmont University. In past years I have presented papers (one on Sally Ann Forrester, one on Bessie Lee Mauldin—you can see I like to write about women with double first names! ), but this year I am going to be part of a panel which will discuss Neil Rosenberg’s excellent book Bluegrass: A History. Bluegrass: A History was first published in 1985, so this years marks its 25th anniversary. (Needless to say, if you do not have a copy, let your fingers do the walking RIGHT NOW over to Amazon and order one.) BAH, as Neil refers to it, is the only book, to my knowledge, to cover in detail the history of bluegrass music. And until fairly recently it was one of the few books that dealt with bluegrass in any way, shape, or form. Nowadays, more books about bluegrass have found their way onto my book shelves and I thought, in honor of Bluegrass: A History, I would list some of these for you. I highly recommend them all. There are a few others which I can’t find on my shelves right now and I’m out of time! Gotta finish packing, eat breakfast, and hit the road. Ten hours to Nashville! I’m taking my well-worn copy of BAH for Neil to sign. Better go put it in my suitcase right now or I’ll forget it. Happy Memorial Day weekend! Drive careful! 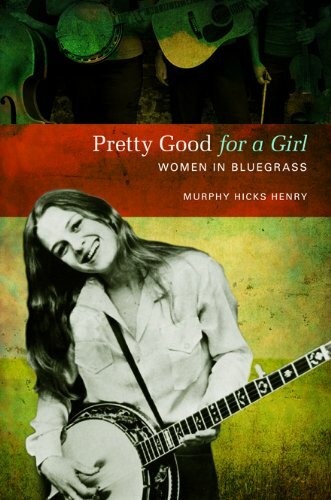 Posted in By Murphy, General and tagged bluegrass history, books on May 27, 2010 by Murphy Henry.